Online platform developed to keep health workers informed on creation of digitised NHS. A group of hospitals and mental health trusts is pushing towards the creation of a fully digitised NHS – one of the greatest challenges facing the health service today. Sixteen acute trusts and seven mental health trusts have taken on the mantle of pioneering new IT solutions through NHS England’s Global Digital Exemplar (GDE) programme. The trusts were chosen because they are already using world-class technology to provide a high standard of care. Through funding and international partnership opportunities over the next two- to three-and-a-half years, they are expected to be at the vanguard of digital improvements. They will share their learning and experiences to enable other trusts to follow in their footsteps as quickly and effectively as possible. In September at the NHS Expo, health secretary Jeremy Hunt announced the first ‘fast followers’ who will be partnered with the exemplars to support the spread of best practice and innovation. A list of 18 acute trusts has been unveiled. They will share up to a total of £80 million over the next three years, and the mental health fast followers are expected soon. The exemplars will share proven models as blueprints that can be rolled out across the NHS. In some cases, this will be sharing software or a common IT team, while others will adopt standard methodologies and processes. Acute trusts have been promised £10 million each, to be matched with local funding, and mental health trusts will receive £5 million. The trusts are taking different approaches to suit their individual needs and patient profile. Plans include fully digitising patient records and test results, plus new ways of engaging the public and patients, recording observations and recognising deterioration in patients. Alder Hey Children’s NHS Foundation Trust plans to use the funding to create a paperless medical record for every child and develop a web portal for healthcare professionals that provides secure access to records for patients. They are also introducing an app for young patients, on which they can be entertained and receive rewards for compliance with treatment. Northumberland Tyne and Wear NHS Foundation Trust intends to introduce systems that enable patients to self-register, access online consultations and gain access to their patient record. Clinicians will be able to securely access records and treat patients online. NHS Digital senior clinical lead Caron Swinscoe says the projects are seeking to enhance the way care is delivered and enable clinicians to work smarter, not harder. ‘This is the way forward to improve patient outcomes and staff experience,’ she says. ‘Staff cannot work harder or faster anymore; they need to work differently. 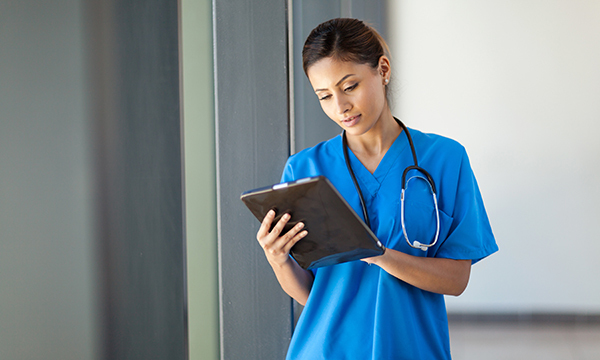 Nursing is the largest workforce, and has an opportunity to take some leadership and really influence the way that digital technology helps to deliver care. A report into IT in the NHS published in September 2016 by Robert Wachter said that none of the changes the health service will undergo ‘are likely to be as sweeping, as important, or as challenging as creating a fully digitised NHS’. Both the Five Year Forward View and the Personalised Health and Care 2020 highlight the need for digital transformation across the health and care system to ensure it remains a sustainable and high-quality service. This includes the aspiration of a paper-free NHS at point of care by 2020. In Next Steps on the Five Year Forward View, published in March 2017, NHS England said, in the future, hospitals will not go to an IT vendor, they will instead choose a hospital to partner with and then implement its B system. This would keep 80% of the IT the same and making only the 20% of changes that are absolutely necessary to meet local needs. Of course, IT development in the NHS to date have been far from smooth. The National Audit Office said in 2011 that the achievements of the £11 billion NHS programme for IT fell far below what was expected and it had failed to deliver the central goal of an electronic care record. An important part of the GDE programme is ensuring that successful models are made easily available to other NHS organisations. NHS Arden and Greater East Manchester Commissioning Support Unit (Arden & GEM) has been appointed by NHS Digital to develop and support a learning network across the GDE programme. The network is tasked with ensuring information sharing and learning is transferred between the sites and across the wider health system to improve efficiency, productivity, and quality. Sally Eason, partner in transformation and consultancy services at Arden & GEM, says she is keen for nurses’ voices to be heard. An online platform to keep people informed is being developed. ‘We want to get nurses engaged to find out what a digital solution can mean to their day job and how they can design and influence it,’ she says.